Today, here are quick mini-reviews for: Ender’s Game and Last Vegas. Starring: Asa Butterfield (Hugo), Harrison Ford (42), Hailee Steinfeld (True Grit) and more. Synopsis: “In the near future, a hostile alien race called the Formics have attacked Earth. If not for the legendary heroics of International Fleet Commander Mazer Rackham (Ben Kingsley), all would have been lost. In preparation for the next attack, the highly esteemed Colonel Hyrum Graff (Harrison Ford) and the International Military are training only the best young minds to find the future Mazer. 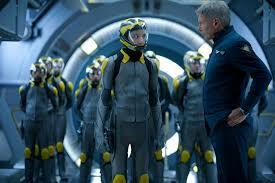 Based on the worldwide best-selling novel, Ender’s Game finally has been made into a film. Author Orson Scott Card received numerous requests from filmmakers since the release of his book to make it into a film, but every single one of them wanted to make it into a love story to follow the trend of recent “teens in angst” series. Thankfully, while I cannot say much in favor for Hood’s X-Men Origins: Wolverine I can say that Ender’s Game was almost exactly what I wanted it to be. 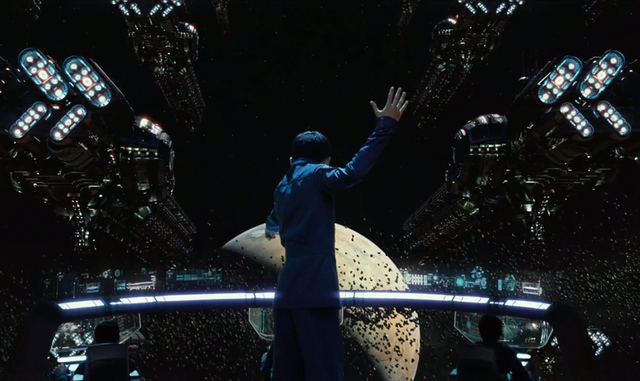 From the beginning, Ender’s Game sets up its parameters and tells the background in narrative form in preparation for the story and characters to come. Visually enjoyable as scifi films go the technology and troubling scenarios are shown both in believable and relatable fashion. Strong in characters and their progression, the film clearly sets its protagonist on his journey and, through the lens of his person, brings this story of massive moral, philosophical and psychological weight to a level that keeps the interest and expectation level high. Those expectations, however, are not met 100% when it comes to the inclusion of characters not needed and the exclusion of pivotal explanations that would have served the story’s telling better. 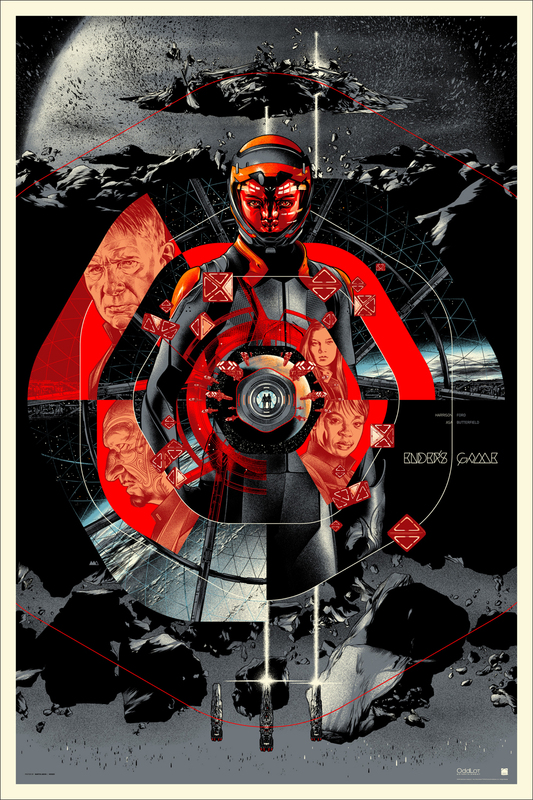 While Ender’s Game maintains a fantastic level of appeal in its set designs, special effects and character cohesiveness, the plot progression missteps in a few parts that accelerate the story but may leave the viewer behind. Its inconsistent pacing, especially toward the end, tends to ruin elements that would have served to ease audiences into the “second ending” that seems almost a bit unnecessary. A runtime of 114 minutes definitely could have been longer to expound on certain elements and characters for smoother transitions. Still, strong performances by Asa Butterfield (who has perfected the art of tearing up on screen), Harrison Ford (thankfully, after so many duds lately) and Hailee Steinfeld. Several of the supporting castmembers filled their roles in a “supporting” manner. 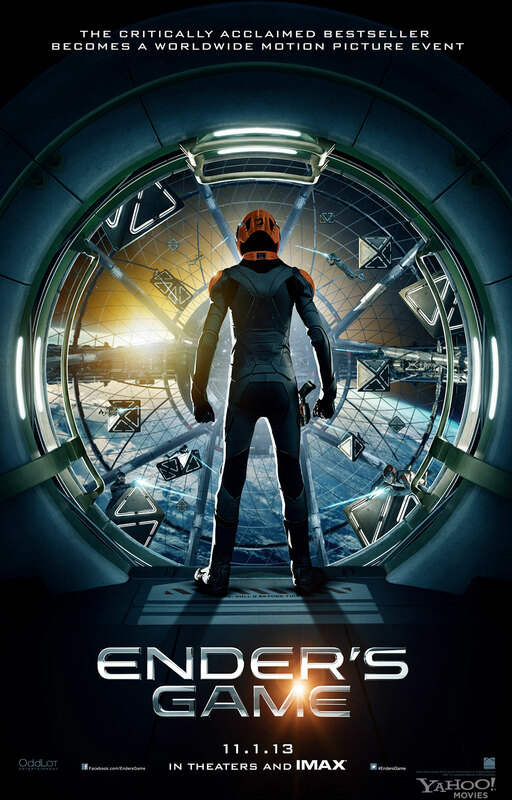 Ender’s Game is a scifi adventure that is better than most with a story that is not overly recycled and therefore can be seen as refreshing to a degree. Contradictions, conflict and character development both help and hinder this game and make the film a mediocre great movie worth seeing on the big screen. Starring: Michael Douglas (Wall Street: Money Never Sleeps), Robert De Niro (Silver Linings Playbook), Morgan Freeman (Red) and more. Rating: PG-13 for language, sexual content and thematic material. The Rat Pack and the Wolf Pack meet in this fun and funny movie of friends, family, love and relationships…you know…all the things you go to Sin City for! The 6-decade old friends meet up in Vegas to celebrate the upcoming nuptials of one of their own. Along the way they find plenty of debauchery, gamble with thousands, judge a bikini contest, get in fights, take risks and hope to find plenty of rewards. One of the most annoying things about this movie is that the trailers already gave away some of the funniest moments that would have been extra delights in the film had they not been spoiled. I’m a fan of trailers, but the ones for this one took away from moments that would have been better had they been reserved solely for those watching. That’s not to say the movie still isn’t fun, but I had to say that first. Together they do all the things that you expect people of a much younger age to do, and they bring the laughs along with it. People watching, picking up girls, practicing dance moves and pounding down the shots, they hang with the best of them and do it better. But that’s not what the story is about. 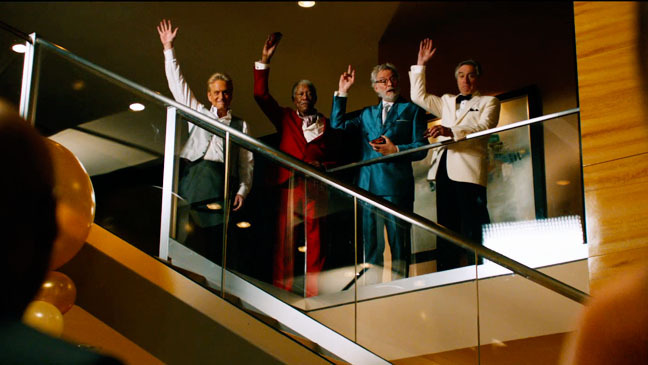 Last Vegas surprisingly also brings about a level of authenticity and bonding that isn’t brought out too much in comedies such as this. Freeman, Douglas, De Niro, Kline…all of them being what one might imagine them to be in real life, bring their level of acting to this story of the nature of friendship that never dies and make it an entertaining viewing. 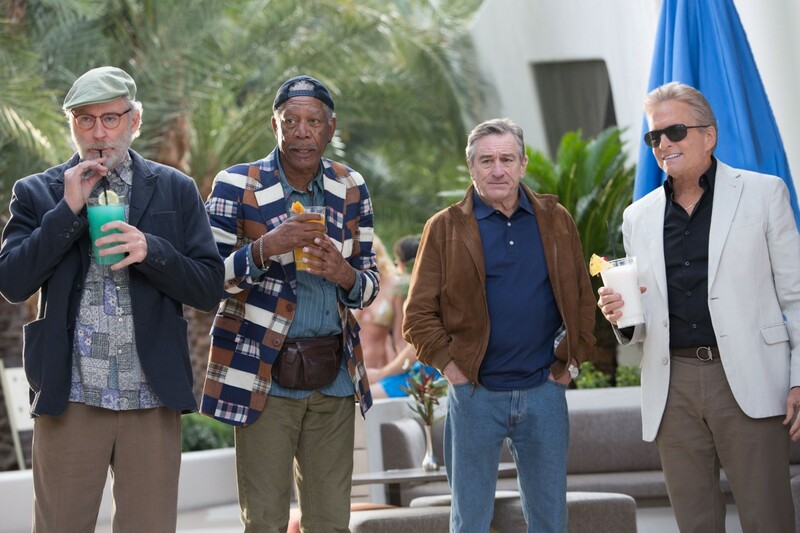 Listen, Last Vegas is endearing, entertaining and full of fun. Reeling in the fun with moments of family, friendship and emotional bonds it not only is a party but it also gets personal with something for many people to relate to. It will not be an award-winning film but it turned out much better than initially expected…thanks to its cast and location delivering. Last Vegas shows that fun and happiness can come at all ages, so long as you’re looking at the right place, I’ll tell you this though, a trip to Vegas with these guys is a trip not to miss! It’s still good, just not super great. I look forward to reading the book now though! How have you been Julian? I’ve been reading reviews for Ender’s Game all morning and they all have pretty much said what I figured they would (except yours since you’ve never read the book). All say the movie missed the major themes of the book. Maybe not missed but never fully explored them. It also missed some of the finer details that were so essential to the book which like you said, wouldn’t have translated well in the first place. Either way, I’ll probably wait to see it on Netflix or something but I’ve already been disappointed with the trailers seeming to show the end of the movie already. Thanks for adding my review to the mix of the others that you have read. I appreciate it. I’ve learned quite a bit about the book from those that have read it and wonder why several things were left out, but it was still a good movie. I know you will wait, but I really suggest seeing this on the big screen because it’s one of those films that benefits from seeing it on such a large screen and may still not disappoint fans as it is being referred to as one of the best adaptations of a book. I look forward to reading it myself. Thanks for stopping in Kim. How have you been? Let me know if you go see it. Been good, T! Hope things are going good for you! I possibly will go see Ender’s Game tomorrow..its in debate with Thor and Gravity. Will be checking out Last Vegas tonight myself, it sounds like a good time, but certainly not one to take all that seriously. Nice reviews, T! I saw Last Vegas again with friends the other day. Had some fun. It really is a film for friends to go see together. Thanks for stopping in, Tom. Read Ender’s Game novel back in college and loved it, but I always felt it could never be turn into a good film. Sounds like Hood did the best he could with the material, this is the kind of work that’s best suited for written words only. I don’t think even the best filmmaker in the world can turn it into a great flick. 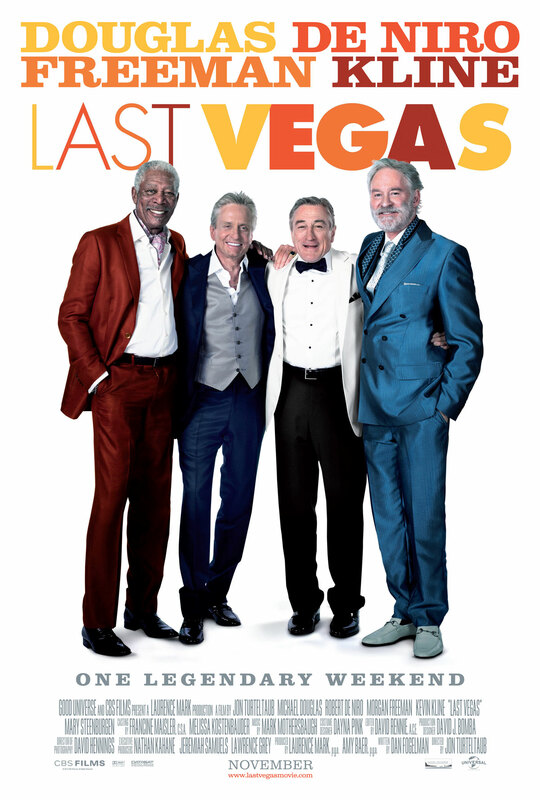 I enjoyed Last Vegas too, it’s a great fun flick with good performances by the veteran actors, I hope I’ll have as much fun as those guys by the time I’m their age, LOL. Also, I love Vegas so I’d watch anything about that town. I am going to be reading it soon and will have to compare notes. I went to see Last Vegas again and still laughed. such fun. Thanks for the comment. Well, it looks like your early prediction of 3.5 stars was right on the money. I have read the book, a couple of times (or if we’re going to be honest probably about 6 times) as well as several of the other Ender books. I found myself enjoying the movie despite myself and can only describe it as simultaneously faithful and unfaithful to the book. It lacked the feel of the isolation, desperation, exhaustion, and genius that truly make up Ender Wiggin but still managed to tell a relatively cohesive story, all be it a very watered down one. thanks for the comment. Yeah, I was a bit surprised. ha. I am glad that as a reader of the book you still have high things to say of it. I can understand where it was lacking and look forward to reading it to know what all I missed. Fun to read this review. So much had to understandably be left from the book (sub plots wouldn’t have had time to develop and partial ones would have confused the audience). I’m curious which characters you thought were not needed. And, I agree Asa has mastered the art of on-screen tears. Looked like Abigail Breslin’s single tear was dropped in her eye off camera the way it streamed from the inside. On a big screen some things look more staged sometimes. Plus I see a lot of real and fake tears in my job. Thank you for reading, Lesley and for the comment. When it comes to the characters, not necessarily do I think some weren’t needed, but the film didn’t give much reason for audiences unfamiliar with the book to find a need for them. Characters such as Anderson or Ender’s brother. They serve a purpose…yes, but it wasn’t explored very well in the movie I felt. Sadly. with or without them, the film alone would not have been impacted and I wish that wouldn’t have been the case as there was time to develop those things more. I liked seeing some of the young actors that I tend to group together doing some great things. The crop of actors like Asa Butterfield, Kodi Smit-McPhee, Abigail Breslin, Chloe Grace Moretz, Hailee Steinfeld and more I tend to crop together and it is great to see so many of them continually getting work. Ender’s Game was fun to watch and one that should be seen on the big screen. I look forward to reading it now.